The waterfall located conveniently along Thomastown Road near the southern edge of the town of Young Harris is as easy to view as looking out the windows of your horseless carriage. Located in a large cove just behind Young Harris College is a beautiful park setting along the banks of Corn Creek. 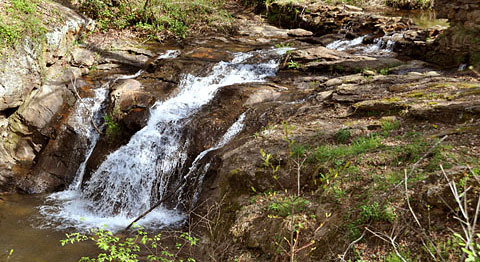 Cupid Falls is the center piece of the park though only one part of a developing site called the “Children’s Interpretive Garden Corn Creek Preserve. In its entirety the garden preserve will feature not only the falls, but also a short trail that crosses two footbridges and follows along both banks of the creek and natural gardens as well. The “Children’s Interpretive Garden Corn Creek Preserve also features a tree house, a gazebo, several picnic tables and the marker for the old Corn Creek Mill site. The preserve’s gardens display and identify indigenous plants, medicinal plants, mosses, a butterfly garden and a small indigenous tree stand. 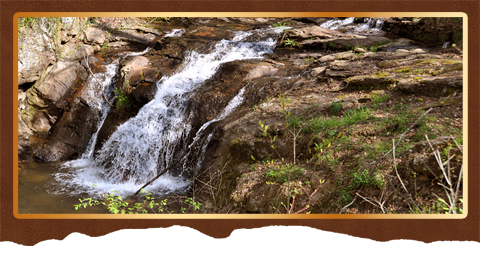 The waterfall is what captures the most attention with its ideal access next to the roadway for those looking for natural wonders in an easy to access area and easy to walk trail. For a taste of the natural beauty of the waterfall the Blue Ridge Highlander has included in its Towns County mobile APP a short video with actual movement and sounds of the falls for our readers to enjoy, anywhere or anytime they need to take a break and get back to nature, even if it is only on a mobile phone or tablet.